Since the 1990s, the integration of GPS and GIS has become more and more popular and an industry standard in the GIS community worldwide. The increasing availability and affordability of mobile GIS and GPS, along with greater data accuracy and interoperability, will only ensure steady growth of this practice in the future. 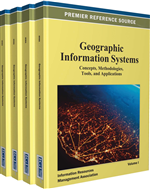 This chapter provides a brief background of GPS technology and its use in GIS, and then elaborates on the integration techniques of both technologies within their limitations. It also highlights data processing, transfer, and maintenance issues and future trends of this integration. When people try to find out where on earth they are located, they rely on either absolute coordinates with latitude and longitude information or relative coordinates where location information is expressed with the help of another location (Kennedy, 2002). GIS maps can be created or corrected from the features entered in the field using a GPS receiver (Maantay and Ziegler, 2006). Thus people can know their actual positions on earth and then compare their locations in relation to other objects represented in a GIS map (Thurston et. al, 2003; Kennedy, 2002). GIS uses mainly two types of datasets: (a) primary, which is created by the user; and (b) secondary, which is collected or purchased from somewhere else. In GIS, primary data can be created by drawing any feature based on given dimensions, by digitizing ortho-photos, and by analyzing survey, remote sensing, and GPS data. Using GPS, primary data can be collected accurately and quickly with a common reference system without any drawing or digitizing operation. Once the primary data is created, it can be distributed to others and be used as secondary data. Before using GPS as a primary data collection tool for GIS, the users need to understand the GPS technology and its limitations.